In a back and forth game it looked like the New York Islanders did enough to force overtime. That would not be the case, due to a costly error. 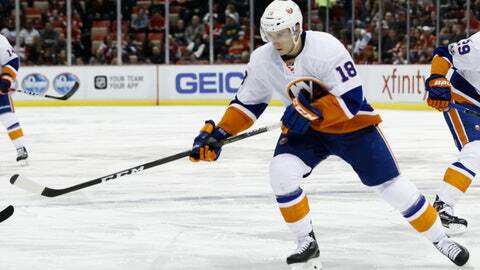 The New York Islanders were red hot heading into their game against Detroit. They looked out of it last night, but it seemed like the game was destined for overtime after Jason Chimera tied it up late. A costly Ryan Strome mistake would prove otherwise. Strome, for some unbeknownst reason foolishly iced the puck in the final minute of the game. He could’ve been patient, there was no reason for him to fling it the length of the ice, but he did. This followed. It led to a goal from Danny DeKeyser. It was certainly off a weird bounce, which wasn’t the first weird goal of the game for the Red Wings. You know if Jack Capuano was still here all we would’ve heard about was the bad puck luck. In some instances last night there was bad puck luck, but this Islanders loss also falls on the side of mental mistakes. The Islanders got sloppy in their own end. When Strome iced the puck it allowed for a face off in the Islanders zone. The Red Wings won it and executed. There was absolutely no reason for it, and I wasn’t the only one who saw the effect of that poor decision. Bad luck there for #Isles, but what was Ryan Strome thinking with the icing 12 seconds earlier? Yikes. As someone who has constantly apologized for Ryan Strome, I’ve just about had it with him. I figured he would take off after Jack was let go. Maybe he just needed a new voice to get him going, but that hasn’t been the case. We all know the player he was in 2014-2015 when he put up 50 points. He’s no where close to that the past two years. He had 28 points last year and he’s on pace for just 26 this year. Just half of his point total from two years ago. It seems pretty clear that Strome’s just a guy who won’t suceed here. He’s Nino 2.0 and the Islanders should just try to move him at this point. He is a defensive liability and he hasn’t given you anything offensively in two years. Although to be fair, he wasn’t the only one to make a poor decision. Jason Chimera trying to force a pass wasn’t smart either. Ultimately the Islanders are going to have to be better defensively. Too many mistakes in a game they probably should’ve won. Another thing, the Islanders have a road trip coming up. They haven’t looked the same on the road so hopefully that’s something that gets ironed out before the long road trip.